Amongst all the most common plumbing problems, a leaking or burst pipe is definitely one of the most annoying and serious. Not only is there damage to the pipe itself (which is usually more widespread than just the specific part or section that’s leaking), there’s also the distinct possibility of damage to surrounding structures like walls, flooring and carpets. This damage, plus an increase in water bills, only ends up costing you more. But, serious problems will generally only happen if a leaking or burst pipe is left untreated. Don’t make this mistake. Contact Metropolitan Plumbing straight away and we’ll send one of our fully qualified, licensed experts to your property. We also have a huge range of spare parts in our vans at all times, so your attending leaking pipe specialist will most likely be able to do a replacement on the spot. What types are you able to work with? Here at Metropolitan Plumbing, we’ve made sure all our plumbers are able to do repairs and replacement for all of the most common piping materials found in Australia, including all brands of plastics and varieties of metals. This way, you don’t need to worry about anything. All you need to do is contact us and our leaking pipe professionals will sort out everything else for you. Until about 15 years ago, copper was the most commonly used material for piping in new homes. These days, it’s very expensive compared to other options and it does corrode more than many people have been led to believe, especially when used for hot water. Despite this, copper piping is still a very reliable material when used for cold water and gas, and is the preferred replacement material for our plumbers. If you have a leaking or burst copper pipe, you need to have it looked at as quickly as possible. Contact Metropolitan Plumbing and we’ll be able to send one of our pipe experts out to you in no time. We stock most sizes of copper piping in our vans, so we should be able to do all work without having to go anywhere. We can also replace an entire network in copper for the very best results. If your cold water is coming out a funny brown colour, or is dribbling out despite having the tap turned on fully, your galvanised pipes will most likely need replacing. Homes built before the 1960’s usually have galvanised pipes, especially for the cold water line. These galvanised pipes are usually steel or iron, which are then coated in a protective layer of zinc, but they still corrode, rust and freeze, eventually bursting or leaking to cause major problems. Contact Metropolitan Plumbing straight away if you think you have problems with your galvanised pipes, or if your galvanised pipes have just started leaking. We will be able to repair or replace your leaking galvanised pipes, however this material isn’t used that much anymore as it is highly corrosive. As such, your attending plumber may recommend and quote a full system replacement in a new material instead. Is your plastic sewer pipe leaking? What about your plastic water pipe? It’s very common to see leaks and burst with these kinds of rigid plastic pipes. Breakages can easily result from any movement in the ground or inside the house, weakening from UV light or accidental knocks. Metropolitan Plumbing has you covered for all leaking or burst plastic piping. We’re able to repair or replace any section of plastic pipe that causes you grief, and can even change your entire system over to a better, more durable piping material. Polyethylene pipe is usually found outside to carry water either away from or to a house or apartment block. Although it is very flexible, highly resistant to weather and UV rays and very versatile, it can still leak or burst. Ground movements pulling fittings apart, incorrect installation and people accidentally damaging it while gardening or excavating can lead to leaking or burst polyethylene pipe. This needs to be repaired by fully qualified professional from Metropolitan Plumbing. Have you just been knocking around in your home or business and hit a Hepworth pipeline? Has one of your Hepworth pipes burst, and is leaking water everywhere? Then you’ve come to the right place! Our permanent van stock also contacts a large selection of Hepworth pipes and fittings, so we should have everything we need onsite right from the start. We’ll have your leaking of burst pipe fixed quickly, efficiently and effectively. Brass is a metal alloy made from copper and zinc, with the combination typically in Australia being 85% copper and 15% zinc. Due to its malleability, strength and resistance to corrosion, brass is a very common material for pipe fittings to be made of. However, brass fittings like connections and valves can still leak, which is something that needs to be taken care of by a professional. Regardless of what’s causing your brass fittings to leak, we’ll be able to repair or replace them. Rehau is a European brand of flexible plastic pipes that are typically used for both hot and cold water applications. Freeze resistant, heat resistant, durable, hugely versatile and easy to install, Rehau is a very good option when having your water system replaced with a new material. If this is a job you need done, or you already have Rehau pipes that have started leaking, you need to contact Metropolitan Plumbing straight away. Installing and repairing Rehau piping is a job for a professional from Metropolitan Plumbing. We’re able to quickly and easily repair any damage to your existing Rehau pipeline, and can also replace it if required. Completely Australian owned and manufactured, Auspex is a brand of flexible plastic water pipe which works particularly well for replacements. This is due to its light weight, durability, ease of installation and resistance to heat, cold and corrosion. If you need repairs or replacements to your Auspex pipeline, then Metropolitan Plumbing is your first port of call. All of our burst pipe experts have the skills, knowledge and experience to carry out any and all work you need done with Auspex pipes, including full system replacements. Do you have a leaking pipe? 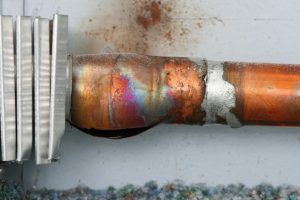 Maybe you should think about having a Metropolitan Plumber repair or replace it with a Sharkbite fitting or pipe. These are high quality, durable metal fittings and flexible plastic piping that can connect to almost any other material. If you have a Sharkbite pipe system that is leaking, We can also fix this for you. Our professionals have the training, experience and tools to repair or replace any Sharkbite pipeline to get it flowing perfectly. Just make sure you tell us you have a Shakbite pipe, and we’ll bring everything we need. Produced by Iplex, the largest Australian owned and operated pipe manufacturer, Pro-fit piping is a flexible plastic pipe system for use with both hot and cold water lines. It’s versatile, lightweight, durable and resistant to corrosion, making it very useful for complete system replacements. If you’re thinking about having your pipes replaced with Pro-fit pipes, contact Metropolitan Plumbing and we’ll be able to do it for you. If you already have Pro-fit pipes that have started to leak, we can repair them for you. If you find yourself with a burst or leaking pipe, Call Metropolitan Plumbing now on 1300 367 333 or fill out an online booking form. We are open 24/7 and can have a plumber to you within the hour* in these emergencies.